Courtesy photoTRPA's Ethan Casaday (far lower right) with his engineering pupils in Haiti. TAHOE, Calif. – Tahoe Regional Planning Agency staff dug into their wallets and scoured shopping and grocery stores continuing the tradition of bringing a little cheer to local children and families in need over the holidays. This year staff provided gifts of clothes and toys to 35 foster children ages 4-17 through Court Appointed Special Advocates (CASA). In addition, TRPA staff adopted a family through the Tahoe Family Resource Center and provided wrapped presents of new, warm clothes and toys for a single mother and her three children, as well as three boxes of food and nearly $600 in local gift cards for the family. “It’s hard not to notice the need in our community,” said Jeanne McNamara, TRPA’s director of Implementation, who initiated the family gift drive. “Staff really got into the holiday spirit with so many gifts and toys for the family,” she said. 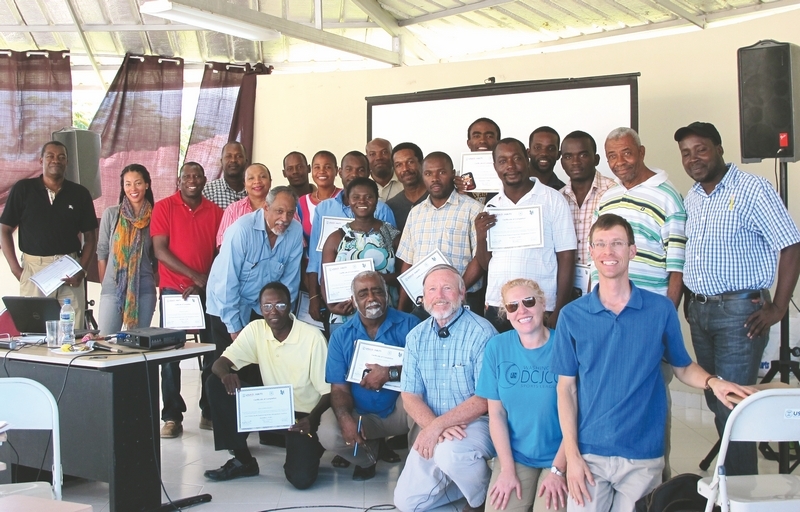 In addition, TRPA Environmental Specialist Ethan Casaday spent a week of his vacation time working with USAID in Haiti teaching a road engineering course to local contractors on how to avoid negative environmental impacts during road construction. The Tahoe Regional Planning Agency cooperatively leads the effort to preserve, restore, and enhance the unique natural and human environment of the Lake Tahoe Region now and in the future. For additional information, call Kristi Boosman at 775-589-5230 or send an email to kboosman@trpa.org.